If you spend half your day in your sweatpants, your eyes glued to your laptop screen and your fingers constantly waltzing on the keyboard then congratulations, you can now call yourself a blogger! But now its time for you to ask yourself, "Is there a future to this forbidden relationship I have with my laptop?" If the answer if yes, then let us take you further into the rabbit hole! For every professional blogger it is necessary to understand the importance of a 'Custom Domain'. Well, we wont go into details but not many advertisers are fond of subdomains and custom domains are sort of the 'Rolling Stones' of the blogging world. I hope you now understand how much you need to be within the heat to get some action. What we are going to explain to you is the easiest way to get a custom blogger domain, it can be done in a jiffy. All you need to do is learn the difference between a domain and a subdomain. Of course, custom domains are way better, you can even showoff with it! You can totally customize your current blogspot domain, for example, (yourdomainname.com) through Blogger which is associated with GoDaddy hosting service. Before this update came around many people had trouble shifting over to custom domains. CName and AName records weren't very helpful too. And DNS settings were just another jumbled up mulch that beginners couldn't understand. But now GoDaddy has simplified the whole process. By a touch of single button, your DNS settings are going to be set and in order. No need for anymore hassles and online tutorials. Buy yourself a GoDaddy domain which costs $7.49 per year (which is cheaper than Blogger at $10 per year). 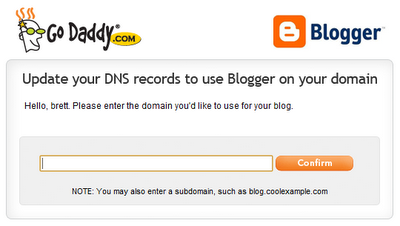 Once bought go to your GoDaddy account's domain setting tools. Type in your desired domain name in to the box as shown below. And you are done for the day. All of your DNS settings for domain would be up and running. Wait for about half an hour and then type in your same domain name into Blogger Domain settings i.e Settings >> Publishing.